Dymo 450 Label Writer Turbo is a compact, fast and functional label printer for everyday use. With this machine you will be able to create and print barcode labels, envelopes, packages, files, binders, videos, CDs labels, name badges,and even more. 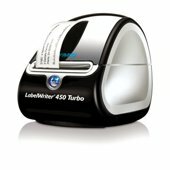 Dymo LabelWriter 450 Turbo is capable of producing over 100 label styles and layouts, you can quickly browse all available label layouts on screen, and best of all you can print up to 71 labels a minute (4-line address label). This unit incorporates an improved 600x300 dpi graphics mode so you can print crisp and clear texts, graphics and barcodes. Dymo LabelWriter 450 Turbo uses thermal printing technology, there is no need to change ribbons, or buy expensive toner or ink cartridges. The only supplies you ever need are the labels. With this unit you will be able to create labels directly from text in Microsoft® Word, Excel®, Outlook® and other programs, without retyping. This machine includes DYMO Label Software that makes it simple to design labels and manage address books all from your PC or Mac®. Dymo LabelWriter 450 Turbo is an ideal space saving unit for all type of companies. This is a convenient and durable machine that can help you increase the number of items to be labelled every day. Label, mail, and file smarter with proprietary DYMO Label™ v.8 Software. DYMO Label™ version 8 Software enables you to create and print address, shipping, file, folder and barcode labels, plus name badges and more—all from your PC or Mac®. Print up to 71 labels a minute* *4-line address label. Uses thermal printing technology – no expensive ink or toner needed, ever. Create labels directly from text in Microsoft® Word, Excel®, Outlook® and other programs, without retyping. Quickly create a one-off label whenever you need one with the QuickPrint widget. Print one label or hundreds, without the waste and hassles of sheet labels. Browse all available label layouts on screen – quickly find the best label for any job. Conserve power with new “sleep mode”. Share with co-workers using Windows/Mac® printer sharing. Put it anywhere – compact size, new design and colours fit any modern workspace. Texts, barcodes (20 types), images & pictures, date & time, serial numbers, lines and boxes and many more. 127mm (W) x 187mm (D) x 134mm (H). Includes: Label template designer ? Label guide to keep labels aligned ? Sleep mode to conserve energy ? Network compatible via your computer ? 100 starter labels (89x36mm) ? 2 year warranty.